Thanks to a massive 4Q to wrap up the year, 2018 came close to setting a new record for combined deal value in the US PE industry. About $277 billion was invested in 4Q, versus a relatively paltry $198 billion invested in 3Q 2018, per our 2018 Annual US PE Breakdown. Fourth quarters often see the highest numbers in any given year, as teams hurry to close in-progress deals before the calendar turns. But this year's race to the finish line was pronounced, especially compared to fourth quarters in other recent years. 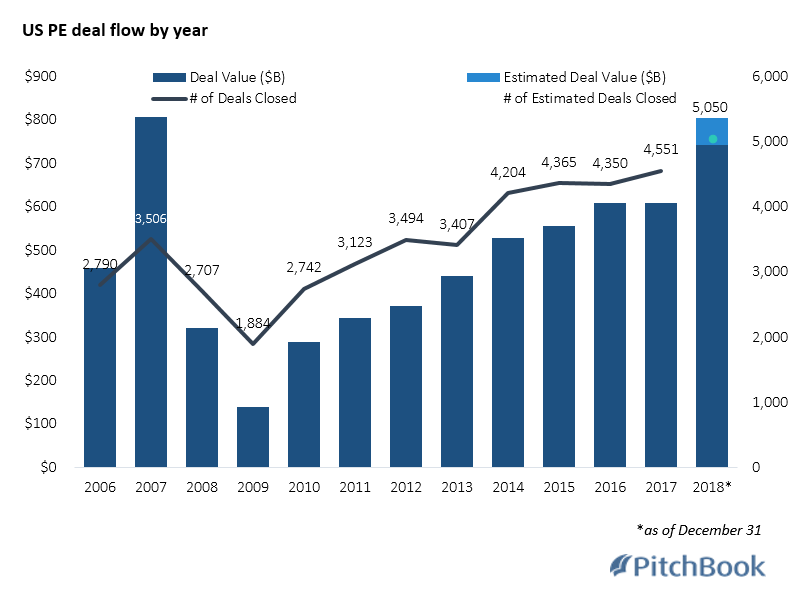 Since the beginning of 2006, the only 4Q that holds its own against 4Q 2018 is 4Q 2007, which clocked in at $272 billion in deal value, but that was through only a fraction of 2018's deal count volume (816 transactions then versus more than 1,300 today). Last year's combined $803.5 billion in estimated total deal value comes within a stone's throw of 2007's record $807.2 billion. As things turned out, 4Q 2007 reached heights that wouldn't be seen for another 11 years. Deal value in 1Q 2008 dropped to $110 billion, largely due to a diminished pipeline; fear of contagion had picked up steam, but the first noteworthy bank failure wouldn't happen until July. In hindsight, 2007's mammoth year was propped up by several blockbuster deals, and the numbers were largely dependent on deal sizes that aren't nearly as common today. Moreover, recent deal flow figures are starting to reflect the massive fundraising statistics of the past two years. Both 2016 and 2017 saw more than $200 billion in capital raised across the US PE fundraising landscape, which marked the first time in the last decade that those totals have occurred in consecutive years. There's simply a ton of dry powder laying around, and we're starting to see it show up on the deal side. Before this past quarter, 3Q's "relatively paltry" $198 billion was, briefly, the highest quarterly total recorded since the crisis. The back half of 2018 inked a combined $474.9 billion, while the back half of 2007 was only a notch or two higher, at $486.9 billion. Read more about PE deal value in our 2018 Annual US PE Breakdown.